"Do No Harm" / "Deus Ex Machina"
In which life and death. When John Locke sits across a diner table from the mother he never knew, who has turned up out of the blue, she tells him that he is “very special” and that their meeting is “a sign of things to come.” She then tells him that he was immaculately conceived, and for a brief moment it appears that the miracle the island delivered Locke was not been his first. What unexplained events awaited in Locke’s past that could help us unlock the meaning of everything that’s happened to him since Oceanic Flight 815 crashed and he walked away from a plane he was wheeled onto? We later learn that his mother was institutionalized for a form of schizophrenia, and that she moreover had purposefully concocted that story at the request of Locke’s father, Anthony Cooper, who needed a kidney and manipulated his estranged son into giving him one of his own. For a brief moment Damon Lindelof and Carlton Cuse—credited with their first script as a duo—suggested something much larger, but in the end “Deus Ex Machina” is a basic human tragedy: Anthony Cooper is a villain, John Locke is a victim, and we can officially add daddy issues to the theme linking Locke and Jack together at the heart of Lost’s first season. “Deus Ex Machine” and “Do No Harm” are a story about Locke and Jack, the two stewards of the castaways, each of whom play a crucial role in the final days of Boone’s life. Locke is the man who gets Boone to believe in the island’s plan, climbing into a plane in search of answers and ending up with a broken leg and other serious injuries. Jack is the man who tries to save Boone, working within the limitations of their island surroundings to try to stop the bleeding and keep them from losing another castaway. In the end, they both fail Boone: Locke’s faith in the island only leads to tragedy, and Jack’s attempt to rely on science without the proper tools makes him blind to the basic truth of Boone’s condition. But at the same time, neither were in any position to save Boone: Locke was losing control of his legs and unable to make the climb himself, while Jack was never going to have the medical supplies necessary to save Boone in his makeshift operating theater in the caves. Boone’s death, while far from inevitable, was not the result of negligence; it was the result of the pitfalls of belief in an environment where uncertainty and instability are around every corner. Coming off of “Numbers,” and the still-debatable mysticism of Hurley’s “curse,” these two episodes again reinforce the two sides of the coin. In “Deus Ex Machina” you have the island as an agent of chaos, showing Locke a vision of the plane crashing into the jungle, reigniting his belief after his attempts to open the hatch fail. It is a vision that Locke interprets as a sign he should go find the burning plane, and yet in retrospect this is a generous reading. 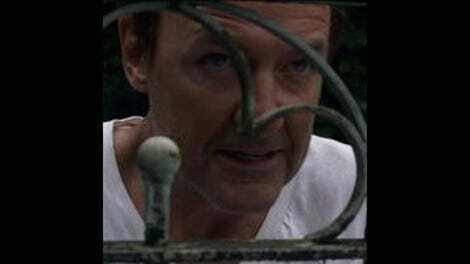 He ignores the presence of his mother, whose strongest connection to Locke personally is playing a role in his father’s scheme to effectively steal his kidney. He also ignores the fact Boone is covered with blood in the same vision, a detail he never shares with Boone and which in retrospect was equally as prophetic as the plane itself. He ignores all of this because he needed a sign, and because his grasp on the island was slipping away from him: Where once Locke gave away his compass because he no longer needed it, here he uses it to get his bearings, no longer as certain as he once was that he has mastered this terrain. Locke’s story demonstrates the challenge of faith, whether in the hope of reuniting with his father or in his embrace of the island in the wake of regaining the use of his legs. In both cases, Locke goes all in, so ecstatic to have regained a part of his life he thought he’d lost forever that he ignores the potential warning signs. In his flashback, Locke poignantly corrects his mother that he was not “adopted”; he grew up in foster homes, plural, and you can sense the pain this involved. It also shows in his station in life, working as an assistant manager at a department store despite what we know to be strong aptitudes for survival and engineering in kind. He imagines what his life would have been like with Cooper, and so when he gets a taste of that life he embraces it, putting his faith in a man who ends up using him for a kidney. It’s a harsh lesson, but not so harsh that Locke resists repeating the mistake when he arrives on the island. And can we blame him? The island, by all accounts, gave him back his legs. Given this miracle, it only makes sense he would place his faith in the island, but the challenge comes when that faith gets tested. When the hatch doesn’t open as he expects it to, he can’t just do what Boone does, which is suggest giving up and moving on with their lives. He can’t do that because he needs to believe, and thus he ignores the potential pitfalls of the plane dangling from the cliff because he knows that the answer has to be there. Forget for a moment that he’s taking orders from a mystical island (and whatever it is he saw in the jungle on his walkabout), or that he’s interpreting incomprehensible dreams; in his mind, John Locke is simply doing what he feels he needs to do to hold onto his humanity in what he’s accepted as a land of untold power and mystery. Jack Shephard has not accepted this. In fact, Jack spends the entirety of “Do No Harm” working against it, cleaning up Locke’s mess by attempting to save Boone’s life. For Jack, the island is a responsibility, one that he takes seriously as a physician. As Locke is chasing the island’s truth in “Deus Ex Machina,” Jack is playing optometrist to Sawyer, the town doctor making house calls. This is what he knows, and from the moment they landed on the island his goal has been to fix things. If Locke’s role has been to get everyone to embrace the new status quo of their mystical island home, Jack has been the one who has been attempting to replicate the lives they used to lead. The difference is that we expect Jack will succeed. As much as Locke’s dream prepares us for a potentially bloody outcome for Boone, the show balked the last time it nearly killed one of its castaways (Charlie), and there’s plenty of reason to believe that even a fairly minor series regular like Boone could survive that fall in the context of an ongoing television series. Jack is a skilled surgeon, and as he goes to work on Boone you can picture this becoming just a speed bump in Locke and Jack’s tug-of-war for the castaways’ trust. But then with each problem that Jack solves, another problem emerges: Sun finds a suitable needle for a transfusion, for instance, but then the blood pools in Boone’s broken leg without having the desired effect. By the time Jack is threatening to amputate Boone’s leg in an attempt to save his life, ignoring the fact that Boone is bleeding internally already and unlikely to survive without the post-op medical care Jack is used to relying on, he seems every bit as blind as Locke, each of them completely trusting in something they’re not in a position to trust. If Locke adapted too quickly to the island, Jack’s failed to adapt at all. In his flashback, we see that he’s always had trouble letting go, leading him to overthink his engagement to Sarah (Julie Bowen) and wonder if he’s simply living up to his promise to fix her following her car accident. In the end Christian convinces him that his real problem is letting go of that insecurity, but that’s an endless loop of self-doubt waiting to spiral into a dark place (which we presume it must have, given that Jack isn’t married to Sarah anymore). And we see that manifest with Boone, as Jack is about to inflict an enormous amount of pain on someone with little hope of him surviving, stopping only when Boone is conscious enough to ask him not to, letting him off the hook for his promises and dying before he can even send a message to his stepsister with his dying words. Although both flashbacks—especially Jack’s—lack subtlety at points, these episodes offer a pivotal turning point in the struggle between these two characters. They believe in different things, but their belief is comparable, and equally self-destructive in both hours. But to reduce this episode to their conflict would be to ignore the reprieves that each character receives by the end of their respective flashback episode. Despite the fact that their beliefs are tested, they are each given a sign that there is hope, signs that highlight Lost at its most emotionally powerful, and which make Boone’s death into far more than a chess piece in the battle between these two characters. Both of these moments are highlighted by the work of composer Michael Giacchino, who has been working his way further and further into the forefront of Lost’s emotional power as the season has proceeded. In the case of “Deus Ex Machina,” the episode concludes with Locke returning to the hatch, slamming his fists into the metal in frustration. He did everything the island asked, putting Boone’s life in danger in the process, and he has nothing but tragedy to show for it. Returning to the theme he used for Locke’s pivotal final scenes in “Walkabout,” Giacchino continues to explore the fine line between miracle and tragedy that defines John Locke and his relationship with both his past and the island. The cue’s punny title—for those that don’t know, Giacchino loves punny titles—“Locke’d Out Again” captures the scene’s double meaning, as we move to Locke’s seemingly futile smashing of the hatch from his being stopped at his father’s gate after leaving the hospital in search of answers. In both circumstances, we’re reminded how close together the quest for meaning and the loss of meaning often manifest: Locke gained a father and lost him almost instantaneously, and on the island he regained hope for his future and saw it slip away as the plane tumbled from its jungle perch. 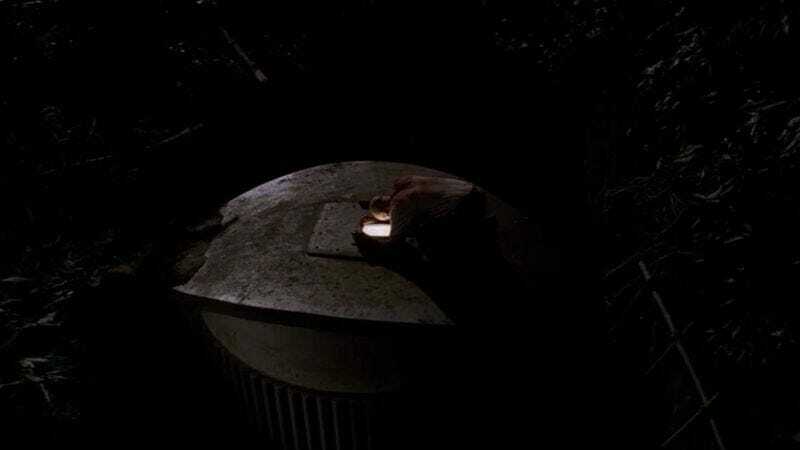 The emotional highs and lows on Lost are not that far removed from one another, and Giacchino’s cue perfectly sets the tone for the moment of hope that brings the episode to its close: a pillar of light shining from the hatch, a sign from above—or below, rather—that tragedy and hope continue to keep close quarters (although which category the light falls into is a question for another day). This is even more apparent in “Do No Harm,” as Boone’s death is paired with the birth of Claire’s son. The moment we discover Claire in labor is a wonderful little procedural move: we think Kate’s slip-and-fall on her way back to the caves with Sawyer’s alcohol is meant to be a marker of uncertainty for Jack’s procedure, with the broken bottles becoming one more obstacle he has to overcome. But then Kate hears Claire, and we realize it’s another detour entirely, bringing the two storylines into conversation with one another. Jack’s self-sacrifice to try to save Boone makes it impossible for him to help Claire, leaving her with the oddball team of Kate (as reticent to be responsible for another person’s life as she was when Jack convinced her to stitch him up in the pilot), Charlie (who is highly emotionally invested but obviously lacks any experience), and Jin (who can’t speak the language but quickly understands the gravity of the situation). And at the heart of it all is Claire, who must face the possibility of bringing a baby she didn’t plan to keep into this uncertain situation. The people responsible for helping bring lives into this world are not unlike the people like Jack responsible for saving lives. For a brief moment, they must balance their own place in this world with someone else’s: just as Jack has to find his moment of clarity where he realizes his increasingly futile efforts to save Boone are about his own insecurities as opposed to Boone’s life, Kate has to realize that her own insecurities—wherever they originate from—are less important than making sure Claire has the proper perspective on the task at hand. And for everyone else simply adjacent to these events, they must find their own sense of balance between the tragedy of loss and the joy of birth, the realities of life and death confronting them head-on in the span of only a few hours. “Life And Death” is, like “Locke’d Out Again,” not the first time we’ve heard this particular melody in Lost’s first season. We’ve heard it twice before in Jack’s previous flashback episodes, most notably when Jack and Kate were rescuing Charlie from Ethan’s noose in “All The Best Cowboys Have Daddy Issues,” which was very much about life and death given that Charlie is brought back from the brink through Jack’s intervention. That duality returns here, as Giacchino delivers the theme in its fullest form at a moment that must transition from the sunrise introduction of Claire’s son to the castaways to the sunrise return of Shannon from her overnight picnic with Sayid. The scene is about both joy and tragedy, neither replacing the other: at the same time as Jack is breaking the news to Shannon, Claire is basking in new motherhood, and one can’t really blame the other castaways for focusing on the positive. Subtly switching from piano to strings when the scene cuts to Shannon grieving over her brother, death is given its own orchestration in the cue but the melodies of life and death are the same, and bridge these two events as a reminder of the delicate balance inherent to the castaways’ plight. Rewatching Lost has reactivated countless memories of the series. This was a show that I wrote a lot of words about, diving into the theories and taking stands on what this show meant by the end of its run. The first season has reactivated those intellectual conversations, pulling out elements of theme and character and mythology in equal measure. It has therefore been a rich experience, one that has been made better by how those same conversations have clearly been rekindled for those of you watching and/or along. But “Deus Ex Machina” and “Do No Harm” were the first episodes that truly sent me back emotionally. Lost has always held a fair degree of emotional resonance, and certainly early episodes were helped by my strong connection to these characters and the emotional events that will happen with them in later seasons. However, even though I knew Boone was going to die, and I knew that Claire’s son was going to be born, and I knew that we were going to reach this moment of life and death, the entire weight of the series’ arc for these characters rose to the surface in those final moments. I’ll discuss in more detail with spoilers below, but there is an enormous meaning in these events that is in no way diminished by knowing what we’re about to see, or by the fact that—as these reviews have documented—I’ve found Boone to be a fairly insufferable character throughout this rewatch. Some of that has to do with how well the episodes build Boone’s death as something bigger than himself, both through the ties to Jack and Locke’s respective character arcs and through the parallel with Claire giving birth. There is a clarity to Lost’s character-driven storylines in the first season that makes moments like this possible, arguably in a way that doesn’t work as well as things become more muddled in later seasons. The flashbacks are still novel, and each moment feels “momentous” in a way that would be impossible to replicate in later seasons but still holds up in returning to this one. While not as novel in the context of the entire series, the death of a series regular meant something, and despite lacking characterization Boone’s death is a pivotal turning point for the series and the season in ways that demonstrate the strength of these episodes. But while those are critical responses, much of these episode’s weight comes from the emotional side, and thus has a lot to do with Giacchino’s score. These are cues that will recur at key moments later in the series, an emotional thread inspiring recall that goes well beyond what happens in the scenes from later seasons. The end of “Do No Harm” is not the first episode-ending montage set to Giacchino’s music, or even the first one set to a version of “Life And Death,” but it feels like the definitive one because of how much it captures the show’s investment in humanity. For as much as Giacchino’s score is asked to take on a number of different roles (action, suspense, etc.) over the course of the series, it is when it is tied to the show’s characters that it does its most important work. The cut from Locke in his car to Locke on the hatch and the juxtaposition of life and death with Claire’s baby and Shannon’s grief are not only emblematic of Lost at its most emotional, but they are also reminders that—no matter where you stand on how the series lands on the character-mythology spectrum—this was an incredibly powerful show when the writing, performances, and music came together in this way. These are not perfect episodes, but those are perfect moments, and provide a powerful statement to kick off the season’s final act. “We’re survivors of Oceanic Flight 815”—given that Lost debuted before significant DVR penetration, it’s hard to believe there was a moment when you couldn’t just flip back and listen to the radio transmission over and over again (although I probably downloaded a torrent of this episode—shhh, don’t tell—and likely went back). Lostpedia doesn’t have Locke’s compass as a continuity error, but didn’t he give it to Sayid and say he didn’t need it? If that was an intentional detail from the writers to indicate his connection with the island slipping away, kudos; if it was just an unintentional meaning, then I hope someone got fired for that blunder. While “Deus Ex Machina” is the first credit for Cuse and Lindelof as a writing pair, “Do No Harm” is Janet Tamaro’s only credit on the series—she was with the writing staff for only a short period. All of Cooper’s actions to trick Locke into giving him a kidney were despicable, but I do sort of love how simple yet effective the “show up early and witness the dialysis” reveal was. The man knows how to manipulate a man into giving him a kidney. It was well thought out. You know, you’d have thought these episodes would have convinced me to learn my blood type in case I end up on a deserted island and someone needs a blood transfusion, but I’d still be guessing. If Coldplay’s X & Y had come out earlier in 2005, I’m imagining a network note pushing them to use “Fix You” during the Jack and Sarah wedding flashback, if only because it might have convinced The Newsroom not to use it. “GIACCHINO YOU MONSTER”—the note I wrote as I got emotional during the “Life And Death” montage. “Eye Care Plan; Sawyer needs glasses!”—this is also in my notes. It seems impossible that Locke’s father’s inherent cruelty could get any more extreme, but we all know that’s not true, don’t we? Swoosie Kurtz doesn’t get a whole lot to do, which makes one wonder if they ever imagined she would play a more substantial role in Locke’s story and just got too sidetracked delving into Cooper’s despicableness. The fact she never returns remains surprising, when returning to this episode and knowing Kurtz’s reputation. I went to watch a YouTube clip of Aaron’s birth to see what music played over it, and then was like “Huh, why is this looping?” and remembered Sawyer stumbled onto it while jumping through time in season five. What a show this is. I’m just going to put this scene from “The End”—you know which scene I mean—in a hyperlink, and tell you that I definitely shed a tear revisiting it. So you’ve been warned.